Back Row (L to R): J. Power, D. O'Connor, A. Flynn, A. Foley, J. Power, J. Terry, M. Burke, J. Morrissey, J. Clancy, T. Parsons. Front Row (L to R): G. Morrissey, J. O'Connor, J. Hogan, P. Whelan, M. Foley, T. Hogan, M. Farrell, M. Hogan. 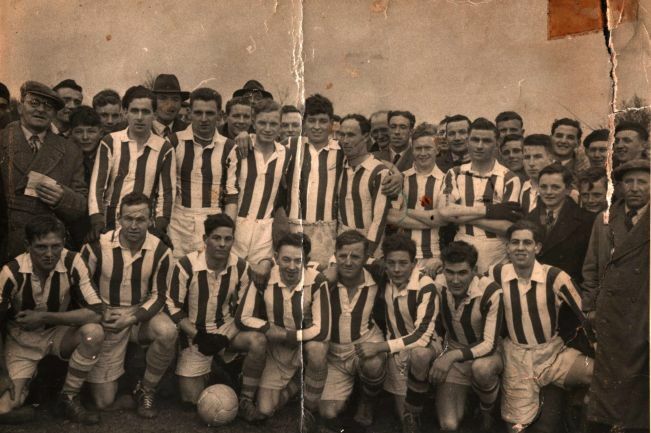 This week's photo shows the Ballinacourty Junior Football team from 1954 that won the Western title by beating Stradbally 2-4 to 1-5 in the final at the Gaelic Field, Dungarvan. However, the Reds appealed claiming that the referee had awarded a free at the end of the game but had not allowed it to be taken. The Western Board upheld the result but a successful appeal to the County Board followed. It ordered a replay which Ballinacourty refused to take part in. Subsequently, Stradbally lost the final by a point to the Geraldines. The whole incident, which dragged on for many weeks, soured the ending of that particular playing year. Our popular Jack the Joker Fundraiser will continue this Sunday night in The Stables Bar where the Jackpot will be €10,704. This week Michael Briggs was drawn out of the drum but did not find the joker but did win €50 while Jack Kiely and John Earley won €25. We appeal to all our supporters to continue purchasing the tickets as the funds raised will go towards our ongoing development works at the club grounds. On Friday night last we played Kilrossanty in Leamybrien in the county league where the game ended in a draw. TEAM: S. ENRIGHT, D. COLLINS, J. MOORE, N. DEE, C. MOLONEY, J. PHELAN, M. POWER, P. HURNEY, R. SHEEHAN, A. LANDERS, G. HURNEY, J. O’MAHONY, S. O’DONOVAN, J. O’BRIEN, S. DELAHUNTY. SUBS: L. HURNEY, R. DUNFORD. This Friday night we play Colligan in our final game of the group stage of the Western Championship in Fraher Field at 7:30 pm. On Sunday last we defeated Melleray in Cappoquin on a score line of 3-13 to 1-14. This victory means that we have now qualified for the knockout stages of this championship. TEAM: E. BYRNE, B. MANSFIELD, P. BREEN, A. O’ RIAGHNAIGH, D. FERNCOMBE, C. ENRIGHT, D. HENLEY, B. HENLEY, D. MORRISSEY, E. YOUNG, A. KEANE, R. RYAN, S. FLYNN, S. BURNS, J. O’BRIEN. On Tuesday night last we defeated De la Salle in their club grounds in the County League on a score of 3-18 to 3-05. TEAM: S. ENRIGHT, J. 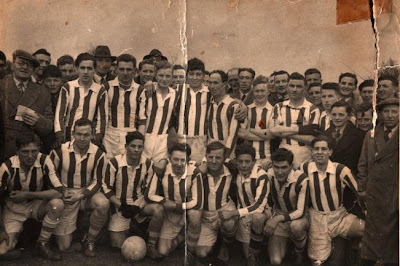 POWER, G. BREEN, R. DUNFORD, S. O’DONOVAN, S. O’HARE, M. POWER, C. HICKEY, E. ENRIGHT, T. HANRAHAN, G. HURNEY, P. HURNEY, C. KINDREGAN, D. COLLINS, M. GORMAN. SUBS: S.CROTTY, N.DEE, L.HURNEY, JP McGRATH. Then on Sunday last we played Dungarvan in our final League game in Abbeyside where after a far from convincing performance we were defeated on a score of 2-08 to 0-13. All concerned will be aware that considerable improvement will have to be made for our Championship game against Ballyduff Upper. TEAM: S. ENRIGHT, E. COLLINS, D. HENLEY, G. BREEN, J. O’MAHONY, M. POWER, S. O’DONOVAN, C. HICKEY, R. FOLEY, E. ENRIGHT, G. HURNEY, C. KINDREGAN, M. GORMAN, P. HURNEY, M. FERNCOMBE. SUBS: D. COLLINS, S. CROTTY, J. PHELAN. Our club bingo will continue in the CBS Hall this Sunday night where the Jackpot is €1,150. The next meeting of the club committee will take place at 8pm this Thursday night in the club grounds. Our minor hurlers were recently defeated by Cappoquin on a scoreline of 1-17 to 2-3. Next up is a home game against Tramore this Wednesday at 7.30. Back Row (L to R): J. Murphy, M. Cosgrave, E. Cashin, J. Kiely, H. Kelleher, M. Lennon, M. Kiely, P. Brett, J. Fraher, D. O'Connor, J. Moloney. Front Row (L to R): J. Kenneally, K. Lennon, J. Hourigan, P. Kiely, N. Cashin (Capt. ), J. Kelleher, T. O'Donnell. Seated (L to R): J. O'Donnell, B. Lynch, P. McGovern, P. Cleary. This week's photo shows the Abbeyside National School team that won the Sheehan Cup at Fraher Field in 1966 beating the combined Tallow-Ballyduff National Schools by 6-2 to 4-2 in what was a curtain-raiser to that year's County Senior Hurling Final. 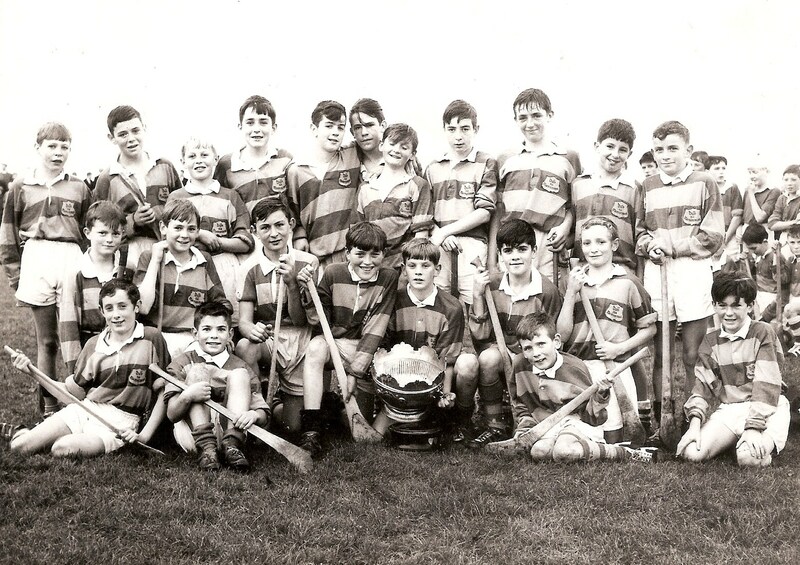 The Sheehan Cup, played for many years, was a trophy for National Schools hurling. 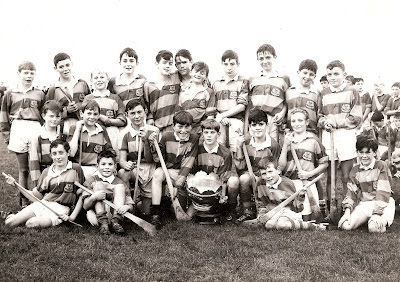 To show the strength of the connection between club and school, many of the boys on this team subsequently went on to play with distinction on various Abbeyside / Ballinacourty teams down the years. Our popular Jack the Joker Fundraiser will continue this Sunday night in The Stables Bar where the Jackpot will be €10,354. This week Kay O’Connor was drawn out of the drum but did not find the joker but did win €50 while Tom Foley and Tom Daley €25. We appeal to all our supporters to continue purchasing the tickets as the funds raised will go towards our ongoing development works at the club grounds. We defeated Rathgormack in the Phelan Cup on Friday night last in Rathgormack on a score of 1-12 to 0-09 and we now advance to the next round of this competition. TEAM: S. ENRIGHT, G. BREEN, D. HENLEY, T. HANRAHAN, S. BRIGGS, J. POWER, M. POWER, S. O’HARE, C. MOLONEY, P. HURNEY, S. DELAHUNTY, R. DUNFORD, G. HURNEY, S. O’DONOVAN, J. O’BRIEN. On Saturday afternoon last we defeated Ballinameela in the Fraher Field in our second last game of the Western Championship League Section on a score of 2-12 to 0-07. This result means that we will advance to the semi finals of the championship. TEAM: R. RYAN, D. HENLEY, J. MOORE B. LOOBY, N. DEE, T. HANRAHAN, M. POWER, C. MOLONEY, E. ENRIGHT, S. CROTTY, A. LANDERS, S. DELAUNTY, D. COLLINS, C. KINDREGAN, S. O’DONOVAN. SUBS: J. RYAN, D. POWER, J.P. McGRATH. The first four teams qualify for the semi finals. This Sunday we play Melleray in our final group game of the Western Championship in Cappoquin at 7 pm. We play this Dungarvan this Sunday in the County League in Abbeyside. Any member who requires tickets for the All Ireland quarter final must have their order with Bernard Shields by this Thursday at 8 pm. On behalf of all in the Club we would like to congratulate John Organ and Aisling Dwane on their marriage over the weekend. 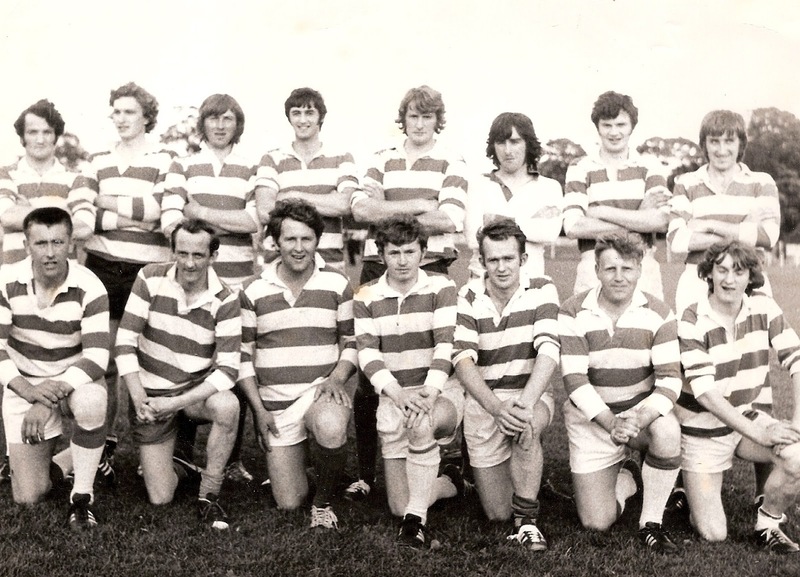 John played for the club for many years and captained us to County Titles at under 14 and Intermediate football. Our club bingo will continue in the CBS Hall this Sunday night where the Jackpot is €1,100. On behalf of all in the club we would like to send our deepest sympathies to the family and friends of the late Jack Flanagan, Ballinacourty. Jack was generous supporter of the club and we send our sympathies to his wife Pat and all his family during this difficult time. Well done to Sean Daly who represented his club and Waterford in the Munster final of the under 16 poc fada on Saturday last in Thurles race course. In a tight contest Sean came in second place. Last Wednesday evening our under 16s were due to play Sacred Heart, but the weather had the final say and it had to be postponed to a later date. Our next game is away to Cois Bhride on Saturday morning next. Minor hurlers are out in their second game in the championship against Cappoquin tonight, Wednesday at our Club grounds. On Thursday night last under 12s played their last game of the league at home to Tramore. This was a thoroughly enjoyable game with great performances put in by all girls. In the end Tramore came out on top. On Saturday morning last Mount Sion came to visit. We fielded teams at under 12, 10 and 8 and an enjoyable morning was had by all. Camogie training will be taking a break for U12 until 14th August and the 17th August for all other age groups. Back Row (L to R): F. Shields, M. Hanrahan, J. Fraher, M. Holland, G. Fives (Capt), J. Kiely, M. Fives, S. Fitzgerald. Front Row (L to R): J. McGrath, P. Enright, J. Power, J. Burns, P. McGovern, M. Mernin, M. Kiely. This week's photo shows the Ballinacourty Senior Football team that drew 1-11 to 0-14 with Stradbally in the County Senior Football Championship Semi Final played in Cappoquin. The replay, at the same venue one month later, ended in an agonising two point defeat, 3-4 to 2-5. Our popular Jack the Joker Fundraiser will continue this Sunday night in The Stables Bar where the Jackpot will be €10,000. This week Jim Egan was drawn out of the drum but did not find the joker but did win €50 while Jimmo Meehan and Oisin won €25. We appeal to all our supporters to continue purchasing the tickets as the funds raised will go towards our ongoing development works at the club grounds. We played Clashmore in the first round of the Western Championship on Wednesday night last in Fraher Field. After a tough Championship game we were most fortunate to emerge victorious by three points and now move on to play Cappoquin in the Western Semi Final. TEAM: P. CASHIN, B. LOOBY, D. HENLEY, E. BERGIN, S. O’DONOVAN, M. POWER, E. COLLINS, C. HICKEY, D. COLLINS, C. KINDREGAN, M. O’HALLORAN, S. CROTTY, J. POWER, R. DUNFORD, N. DEE. On Sunday last we defeated Sliabh gCua in the Western Championship in Faher Field. This victory means that the team has qualified for the Western Semi Finals with some group games to be played yet. This Saturday we play Ballinamelia in Fraher Field at 1:45 pm. TEAM: R. RYAN, D. HENLEY, J. MOORE, N. DEE, D. COLLINS, T. HANRAHAN, M. POWER, R. DUNFORD, C. MOLONEY, S. DELAHUNTY, A. LANDERS, C. KINDREGAN, S. O’DONOVAN, L. HURNEY, E. COLLINS. On Sunday evening last our Junior Footballers rounded off a good weekend for the club with a spirited victory over Glen Rovers in Cappoquin which means they have now qualified for the Western Semi Final. Semi Final – Ballinacourty v Geraldines. This Friday night we play Rathgormack at 7:30 pm in the Phelan Cup in Rathgormack. On behalf of all in the club we would like to wish Richie Foley and all the Waterford Senior Hurlers the very best of luck ahead of this Sunday’s Munster Final. Our club bingo will continue in the CBS Hall this Sunday night where the Jackpot is €1050.